With the holidays around the corner, we wanted to share our FAVORITE pumpkin and pecan pie recipes. This pumpkin pie bursts with flavor and its rich, smooth, thick filling on flaky homemade pie crust is to die for. The pecan pie combines a buttery pie crust with a sweet, dense and chewy filling with lots of YUMMY pecans. These pies are PERFECT on their own or with whipped cream and/or vanilla ice cream. Serve these DELICIOUS pies at Thanksgiving or Christmas. Fresh vs canned filling? 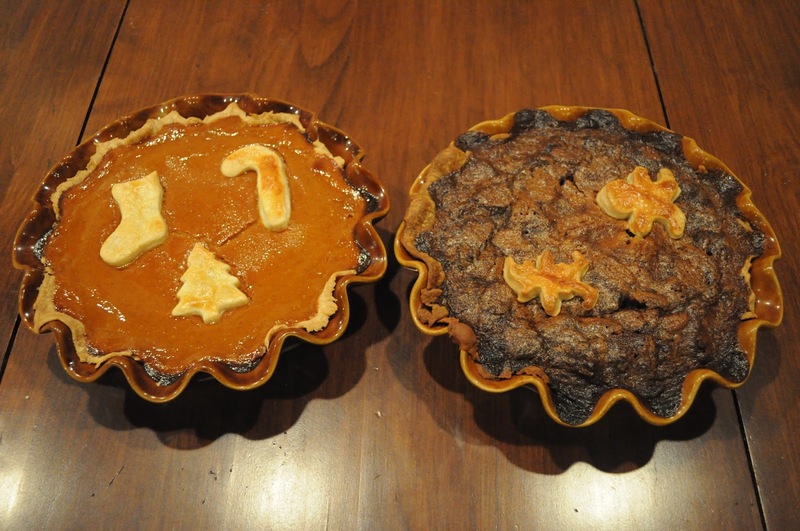 Baking two pies from scratch, along with the rest of your holiday dinner is time consuming enough. I always use canned pumpkin puree. One of these days, I’ll do a side by side taste test! The Food Network’s pecan pie recipe is to die for – it’s definitely our favorite pie recipe! We use the same recipes for Christmas desserts. Just use Christmas cookie cutters instead! We recommend serving pie with fresh whipped cream. I like making whipped cream with a Kitchen Aid Stand Mixer, but Olivia of My King Cook has lots of amazing tips on making whipped cream and not just in a stand mixer!